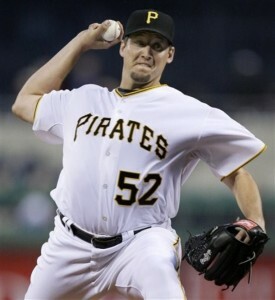 How Did Joel Hanrahan Win a Game For the Washington Nationals While Playing for the Pittsburgh Pirates? « Did Tommy John Really Once Make Three Errors on the Same Play? 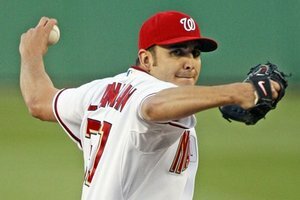 BASEBALL URBAN LEGEND: While he was on the Pittsburgh Pirates, pitcher Joel Hanrahan won a game on July 9, 2009…for the Washington Nationals! Recently, the Boston Red Sox acquired closer Joel Hanrahan from the Pittsburgh Pirates. The Pirates acquired him from the Washington Nationals in 2009 (along with outfielder Lastings Milledge) for outfielder Nyjer Morgan and relief pitcher Sean Burnett. At the time, Hanrahan had an 0-3 record on the season. On July 9, 2009, Hanrahan collected his first win of the season. The only problem was that the Pirates had the day off! Read on to see how it happened! You see, back on May 5, 2009, the Nationals were playing the Houston Astros in Washington D.C. The game went to extra innings, but ultimately, with the game tied after the top of the eleventh inning finished, the umpires decided to temporarily suspend the game and finish it at a later date. Hanrahan had been the Nationals pitcher in the top of the eleventh inning. So before the Nationals played the Houston Astros in Houston on July 9, 2009, the two teams picked up where they left off (the game was in Houston, but they played the rest of the game as though it was in Washington – so the Nationals batted in the bottom of the inning). The Nationals came to bat in the bottom of the eleventh inning, and after a one-out walk, newcomer Morgan came in to pinch-run for a batter. A single moved him to second base. The next spot would be Hanrahan’s in the lineup, so obviously, a pinch-hitter came up and promptly hit a ground ball to short. The Astros got the force at second, but the relay throw to first was wild, allowing Morgan to come in to score (he had moved up to third on the ground ball). So, since Hanrahan was the last pitcher to pitch for the Nationals, he was awarded the victory, even though he was no longer on the team! You see, suspended games are treated as though they finished on the day back when the original game took place. So actually, Hanrahan technically HAD a win when he came over to the Pirates – it’s sort of like a time warp (the craziest example like this would be what would have happened if Alex Rodriguez had hit a home run when the Yankees were playing a makeup game last year – had he done so, since it would have “technically” taken place before the game where he hit his 500th home run, it would thereby make the home run everyone thought was his 500th home run now his 501st home run and his 499th now his 500th – luckily he did not homer, or else many heads would explode). This entry was posted on Saturday, April 13th, 2013 at 7:54 pm	and is filed under Baseball Urban Legends. You can follow any responses to this entry through the RSS 2.0 feed. You can leave a response, or trackback from your own site.